This simple recipe allows the flavor of the salmon to shine. 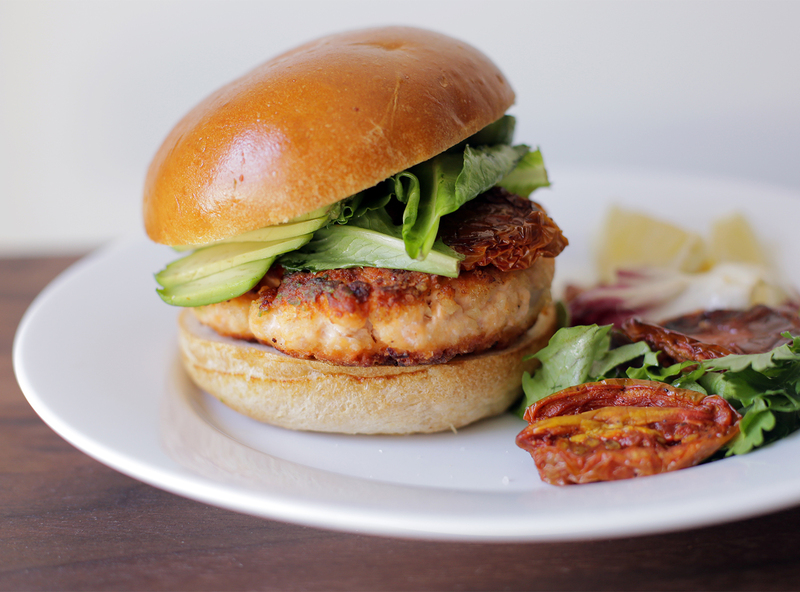 I prefer to use fresh salmon, as opposed to canned salmon, the extra effort and cost is worth it for a better tasting burger with a superior texture. I top my salmon burgers with oven roasted tomatoes—something I like to keep on hand, especially during the summer tomato season—avocado and greens with a squeeze of lemon. 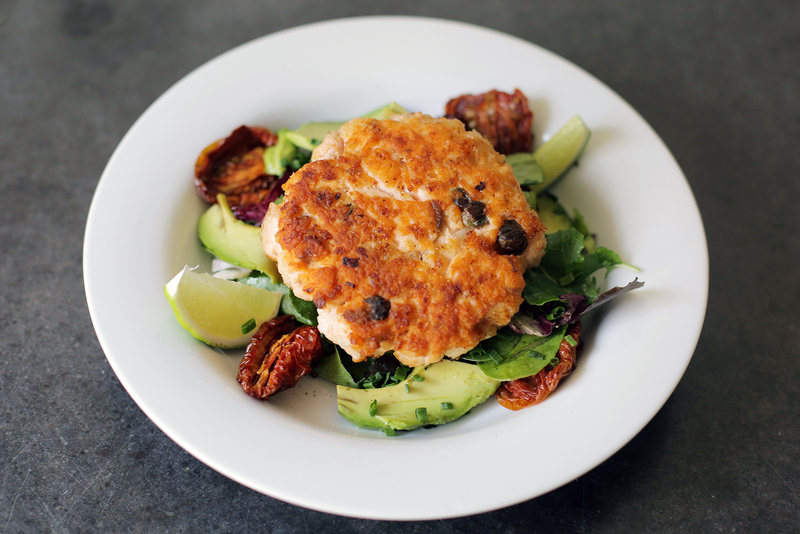 You can also skip the bun and serve the salmon patty on top of a salad. Easy, delicious and healthy. First, roast the tomatoes, which can be done a day or two in advance if need be. Halve the roma tomatoes lengthwise. Place them in a mixing bowl and toss with olive oil to coat. Season with salt and pepper. Place the tomatoes on a baking sheet lined with aluminum foil. Arrange cut side up. Bake in the upper third of the oven for 4 hours, until tomatoes are caramelized and shrunken. Remove from the oven and reserve. Place half of the salmon and the mustard into a food processor and pulse until well broken down. Add the remaining salmon, garlic and shallot, and pulse 3 or 4 times. Place the salmon mixture in a mixing bowl and add the breadcrumbs, capers and lemon juice. Season with salt and pepper and mix until well combined. Shape into 6 patties. Set aside. Add the butter to a skillet over medium heat. Griddle toast the buns and reserve. Add the vegetable oil to a skillet over medium high heat. Cook the salmon burgers for about 3 minutes per side. Do not cook past medium. Alternatively, you can grill the burgers. Prepare a grill for medium-high direct heat cooking. Clean and oil the grate. Cook the salmon burgers over the heat for about 3 minutes per side. Serve on buns and top with oven roasted tomatoes, avocado slices and some dressed greens. You can also skip the bun and serve the salmon patty on top of a salad if you’d prefer.